Women veterans who have received an honorable or general under honorable discharge from the military may be eligible for care. Usually there is no charge if you receive care for a service-connected disability, have CHAMPVA, have recently separated from the military, or if your income is below a certain amount. A DD214 or a VA medical card from any VA Medical Center will be necessary at the time of registration. Women's Health Services are also provided at our Community Based Outpatient Clinics. The Women Veterans Health Care Program is an integral part of the VA New Jersey Health Care System (VANJHCS) and the Veterans Integrated Service Network (VISN2). 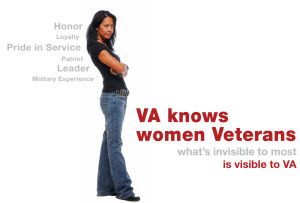 While we offer services and programs that meet the needs of all Veterans, we pay special attention to women veterans. Our focus is on health promotion, disease prevention and management, and the emotional wellbeing of women Veterans. Our goal is to present diverse and innovative programs that care for, educate, and support our patients during all phases of their lives. Our patient Education Resource Center (PERC) is available at the East Orange and Lyons campuses to provide you with the most current health resources. We are committed to providing accessible and comprehensive health care of the highest quality to women Veterans in a safe, comfortable, and private setting. We are determined to be responsive to gender-specific needs by making available or arranging for all authorized services for women Veterans. The following services are available throughout the VANJHCS, VISN 2, but may vary from site to site. We invite you to take advantage of our special programs for women Veterans. Your active and vocal participation in the health care process is important to our success. We value the opinions of Veterans and want to listen and respond to your health care concerns. Our Women Veterans Program Manager (WVPM), Janine Decker, is available to assist you. *These services are provided through our Non VA Care Program with our Community Partners. Comprehensive care for women Veterans is defined as care by a women’s health primary care provider who is interested and proficient in women’s health and can provide equitable primary care and gender-specific care to women Veterans. This includes access to primary care, gender-specific care, specialty care (cardiology, endocrinology, orthopedics, etc. ), and mental health care in the context of a continuous patient-clinician relationship. Women’s Health Primary Care Providers are located at all VANJHCS sites including Outpatient Clinics, centrally located throughout New Jersey. We offer evening and Saturday appointments at most locations. Mental health services include evaluation and assistance for issues such as depression, mood, and anxiety disorders; intimate partner and domestic violence; sexual trauma; elder abuse or neglect; parenting and anger management; marital, caregiver, or family-related stress; and post-deployment adjustment or post-traumatic stress disorder (PTSD). Women, and men as well, may experience repeated sexual harassment or sexual assault during their military service. Special services are available to women who have experienced MST. VA provides free, confidential counseling and treatment for mental and physical health conditions related to MST. More information is available about MST from the national Women Veterans Health Care program and the VHA Office of Mental Health. Management and screening of chronic conditions includes heart disease, diabetes, cancer, glandular disorders, osteoporosis, and fibromyalgia as well as sexually transmitted diseases such as HIV/AIDS and hepatitis. Reproductive health care includes maternity care, infertility evaluation and limited treatment*; sexual problems, tubal ligation*, urinary incontinence, gynecological disorders, and others. Rehabilitation and long-term care. VA offers services to those in need of rehabilitation therapies such as physical therapy, occupational therapy, speech-language therapy, exercise therapy, recreational therapy, blind rehabilitation, and vocational therapy. Rural Health Program provides comprehensive primary care medical services in the comfort of your own home. Home Based Primary Care (HBPC) is targeted to Veteran who have complex health care needs for whom routine clinic-based care is not effective and for those who have difficulty getting to the clinic. Long term care and HBPC are limited to those meeting specific requirements.